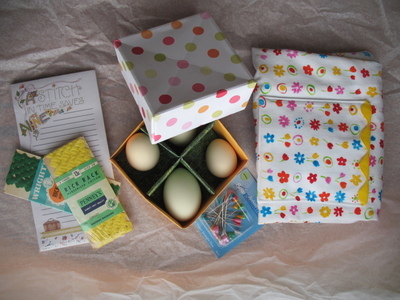 actually did receive this package, so I feel safe in posting pictures of the contents that I sent for the Spring Sassy Apron Swap (see button on sidebar for Swap link). That's a magnetic notepad, some vintage rick rack, an origami folded box (link to directions again on sidebar) with two naturally green and two quail eggs (blown), heart pins, and the folded apron. 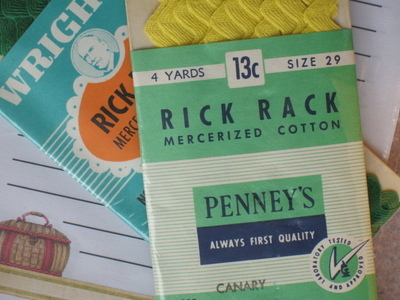 Can you imagine paying 13 CENTS for a package of rick rack? From Penney's? Awesome. 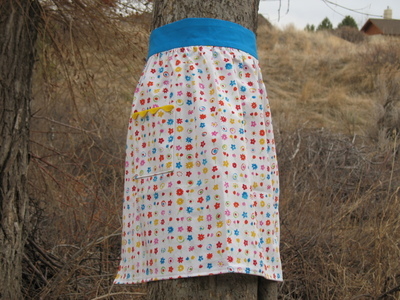 This apron was made from a pattern that had a much wider waistband like an inverted V, but when I made it up that way, with a matching pocket no less, it looked terrible! And when I tried it on I just said "blech". So I took it apart and changed the pocket and narrowed the waist. Ahhh, much better. Thanks to my partner for her patience in having to wait for her package. A Blessed Holy Saturday and Happy Easter to you all. See you in a few days. Don't O.D. on the chocolate! Very sweet apron. 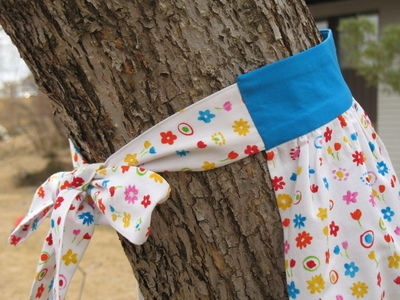 I love rickrack myself, and I love that cheerful fabric. That is quite the package! Great job! And I have always been a huge Mary Engelbreit fan so the notepad was perfect :) you were amazingly thoughtful and kind and I just appreciate it all SO much!! I felt so loved!!! This is a Flickr badge showing public photos from Stacie.Make.Do. Make your own badge here. Click on a photo to see the captions.